A great twist to the traditional banana cream pie. This is a must-try recipe for any banana cream pie lover. 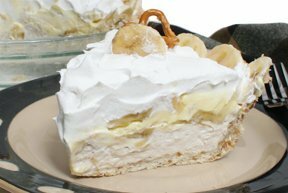 A unique crust that is layered with cream cheese, bananas, pudding, and whipped topping makes it impossible to resist this tempting banana cream pie. Instructions on how to make your own pie crust, with tips on mixing, rolling and handling for the perfect crust. For those who do not like pie crust, we will show you how to make a simple and tasty crumb crust.